Or view larger version. Untitled. June 4, 1966. Unknown photographer. Gelatin silver print. Collection of Oakland Museum of California. The Oakland Tribune Collection. Gift of Alameda Newspaper Group. This photograph of an United States Marine was taken on June 4, 1966. 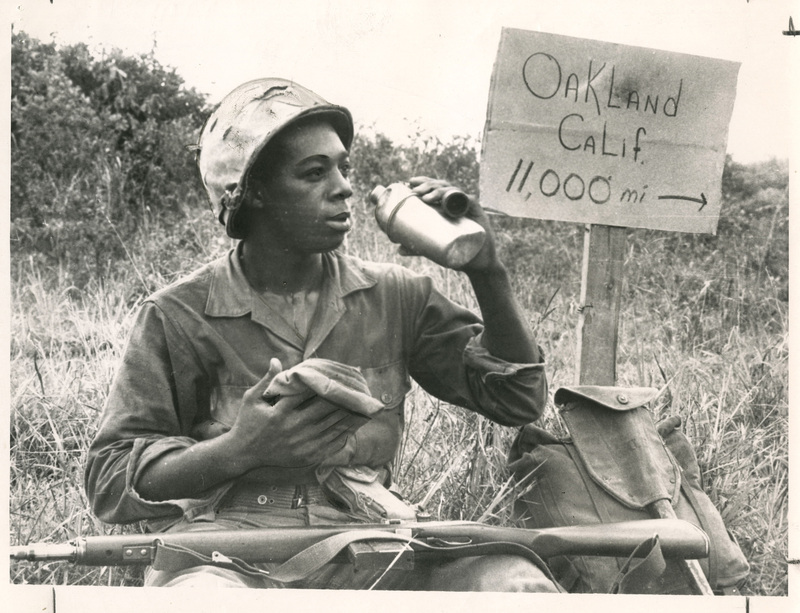 He is shown taking a drink out of his canteen, while sitting next to a sign, which reads, “Oakland, Calif. 11,000 mi.” This Marine was part of the First Battalion, Forth Regiment, of the Third Marine Division, and he, along with the other members of his division were positioned near Hue, farther north than any other U.S. combat unit in Vietnam.